Yeah, the gap between the stones can be seen clearly and it suggests that it was packed so loosely that it will sure collapse with a good rain. The stone in between is so small which makes it so weak. It is a method of "Locking" the retaining wall to the soil bank behind it, but shouldn't be needed in your case. As far as the other landscaping fabrics are concerned, it depends on what purpose they are being used for. 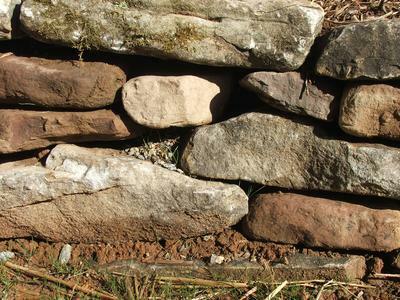 The drainage that the contractor should have installed (Especially if you requested it) should be located in behind the base stones of the wall. This drain pipe is usually protected by a landscape "sock" to keep it from getting clogged. This pipe will take the water away to another location during times of heavy rain and saturation. The pipe is placed in behind the basestones. The forces of gravity on the water will force the water into the openings of the pipe. This is what we call hydrostatic pressure. You can still use a polypropylene fabric between the gravel back fill, and the soil bank. This will keep the soil from migrating into your drainage rock. This will allow more free flowing drainage. This is typically done more in frost climates to keep the drain rock clean as soil will hold moisture and can lead to heaving. For the time, effort, and cost, I use this woven polypropylene fabric, gravel back fill, and a drain pipe for most of my walls. There may be times when this isn't needed (smaller garden walls), but the cost of rebuilding a retaining wall usually outweights any overkill in construction. (This is a personal choice). If you have clay soil, there may be other options for you of controlling the water at the surface rather than rebuilding the wall. One of a landscapers first considerations with any project should be controlling water at the surface. It is acceptable for the wall to allow a certain amount of water to pass through, but it sounds like you have more than you need. As far as the stone dust you have left over, is it possible to consider a feature up to the walls edge that could control heavy surface water? Perhaps a dry river bed lined with stone dust? I would like to look at this more in depth if I can, but will require some more pictures of the area including the source of the water and the overall bigger picture if possible. Please email me personally at kevin@dream-yard.com so I can respond.